I recently finished the video below with help from Brenda June. Brenda is a friend and a middle school math teacher from my district. It's designed to give some simple tools to students that they can use to be self-sufficient learners. It's a result of many discussions over the past couple years about our classroom experiences and ideas about learning that we've discovered from many sources. Most notably, we were both greatly inspired by Jo Boaler's Mathematical Mindsets and John Hattie's work. The video (which will eventually be the first of two) provides some simple images and ideas comparing learning to a journey. While that's nothing new, we hope the simple visuals provide a concise, effective way to present it to students. It includes our "3 Big Questions" that can help students identify their next step and it provides our take on a familiar four-point scale for students' regular self-assessment. I also created this Google Slides presentation, which provides a space to write the learning target and success criteria for a lesson. There are summary slides for the 3 Big Questions and the four-point self-assessment scale. We have received some helpful feedback from our students. We would love to hear any thoughts about the video from other teachers. Please send me an email or comment below about its usefulness or how we might improve it. I used Camtasia to create the animation. What a great program! 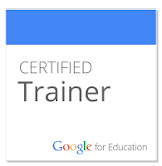 Many thanks to TechSmith for providing a copy through their program for Google for Education Certified Trainers. Most images in the presentation came from Pixabay. This video is part of the grant funded project Brenda and I started in September. You can read about our project for MACUL here.